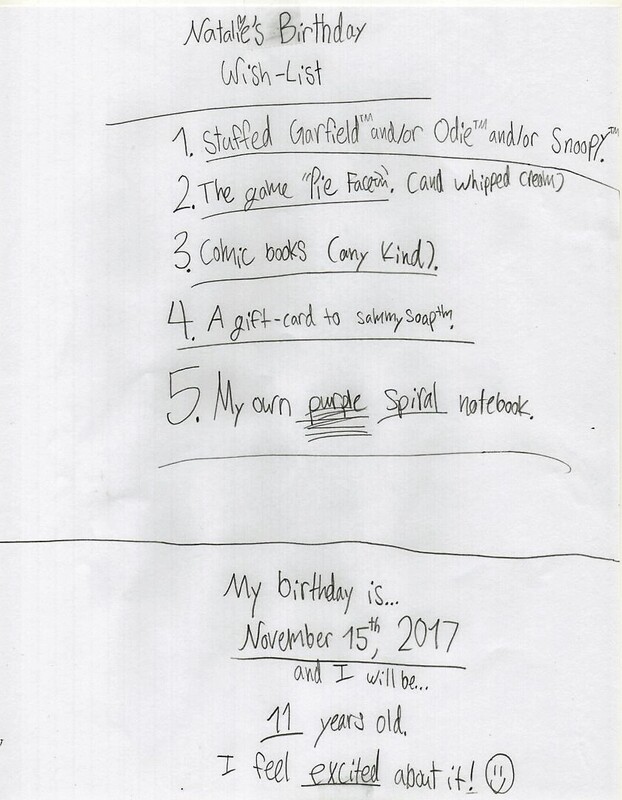 Natalie turned 11 nearly a month ago, but still I write this post because I can't really believe it. The months leading up to her birthday we said good-bye to her Barbie doll house, her vast collection of Littlest Pet Shop critters and dress-up clothes -- all of which were a huge part of her every day world. Her bedroom door is located right off the kitchen and while I fixed dinner I relished listening to her speak in different voices as she brought her toys to life in her imaginary world. 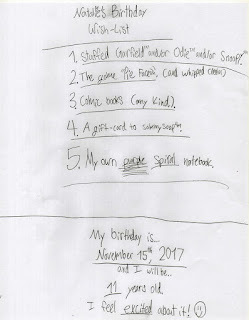 She's growing up -- but as I read her birthday wish list, (conveniently tacked to her bedroom door) I realize while she may have left some of her dramatic play behind, she will never lose her wonder. This year was also the first year she did not have me create a themed, birthday party with friends. She felt she was too old for one. While I breathed a bit of a sigh as her parties tend to stretch my creative abilities -- I also felt sad as I realized I really enjoyed the process. I can feel the strings loosening. She did however, ask for a scavenger hunt. Ah ha! I have a role. I'm going to play it to the hilt. I set about creating clues that would lead her to the places where we could purchase her presents together. The end result being a truly fun family day making memories. In the end - her birth-day became a multi-week celebration as we met up with family and friends on various days as their schedule allowed. She's growing up...but she's not growing away. At Fantasy Comic Shop she selected a timeless Calvin and Hobbes book. I think she's read it three times already. After watching a KMOV news clip on Sammy Soap - she decided she wanted a gift card from the store. If you haven't been to Sammy Soap in Kirkwood -- you must! More than 100 varieties of handmade, all-natural soaps. They offer free tours that are FABULOUS and include lessons in history, geography and chemistry! Sammy Soap was started because a mother who was raising an adult child with special needs, was looking for a way for her son to be a contributing member of the workforce. At the end of the tour - the kids got to create a bar to take home. Our friend-mily - the Braun Bunch - surprised Natalie with a visit to Culver's. Schedules are tough but they made a mid-week party a priority. On her actual birth-day, my mom and dad surprised Nat with a visit, a fancy cake and her favorite pizza - Imo's!